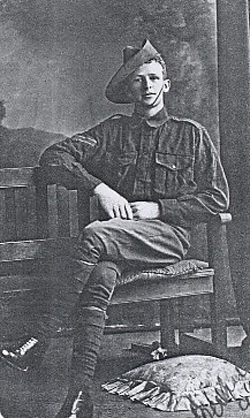 My Great Uncle Herbert enlisted at the age of 21 and was a member of the 15th Battalion Australian Army where he held the rank of Lance Corporal. Within two weeks of the initial landing at Anzac Cove in Gallipoli (25th April 1915) Herbert was killed in action on the 9th March 1915. He was buried at the cemetery at GALLIPOLI 23. Johnston's Jolly. Unfortunately I know little more details than this. I have attached a photo of Herbert which was probably taken in Sydney before he sailed to Cairo. Photo of Herbert Norman May.